Back in my university days I often used to make myself aloo chat when I had the munchies. It was so quick, cheap and easy that it made a perfect snack to nourish my hunger. I would place it in a bowl with a dollop of natural set yogurt on the side and then dip the potato cubes into the natural yoghurt. Happy memories. To this day I continue to cook it and often serve it up with a dal for a vegetarian supper, or as a complimentary dish if I am cooking a larger Indian banquet with a meat and/or fish curry. At this time of year when the cold sets in this bowl of carbs is highly appealing and is easy to feed to the whole family. As I only chop the chillies in two I find that it does not make the dish too chilli, unless of course you actually munch on the chilli – which I always leave for the adults to do. On the subject of munching chillies, if you are feeling a little under the weather I really recommend eating a cooked chilli either in a dish like this or one of my dal dishes (see under Recipe Library). Packed full of vitamin c, they give the immune system a good burst and can bring you back to the land of the living if you are feeling under the weather. Just remember if you ever find the chilli too hot, don’t drink a glass of water as that will spread the heat across the tongue, milk and yoghurt however are able to numb it as they contains a protein called ‘casein’, which breaks the bond between the the pain receptors in your tongue and capsaicin, which is an oil found in chilli – the seeds are always the hottest part so you can remove these if you prefer less of a kick. 1. Place the cubed potatoes in a pan of boiling water for 13 minutes. You want them to begin to be soft, but not completely soft that they just fall apart! 2. Strain the potatoes. In a large pan heat the oil and add the cumin seeds, chillies and turmeric powder. Let the sizzle for 30 seconds before adding the potatoes and coating them in the seeds and powder. 3. Cook the potatoes on a medium low heat for a further 7 minutes, turning carefully a couple of times. Add the salt, stir one last time and then serve. If you find the potatoes are still a little hard, add a little water and place the lid on the pan and they will soften after a couple of minutes. 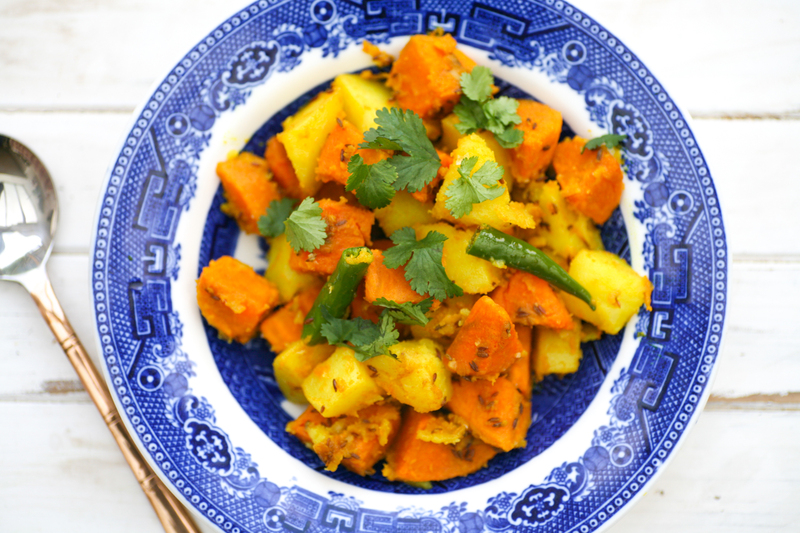 an alternative way to cook this is to omit the first step and let them fry in the oil with the cumin seeds, turmeric powder and fresh chilli, immediately. Once they begin to bronze add a little water and let them soften. At university I tended to opt for this version, but now I find that parboiling them first ensures that they soften to how I want them. 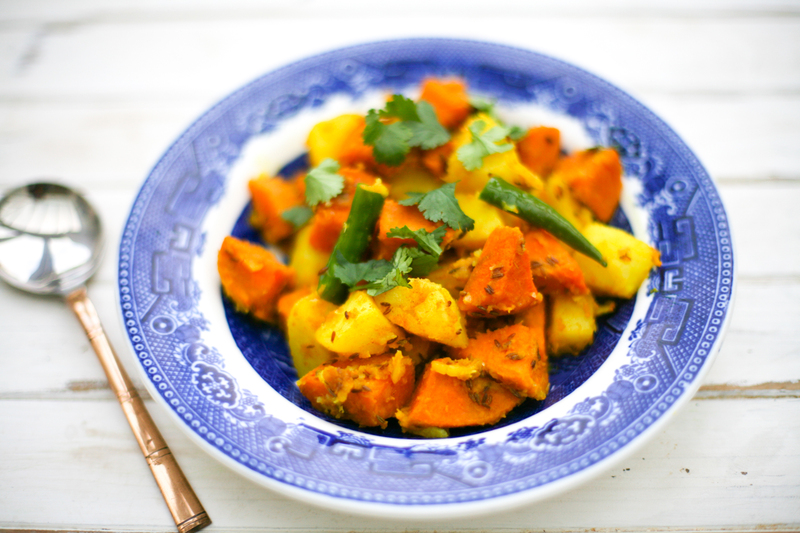 If you like this potato recipe you may also like to try my ‘Curried Potatoes’ another time. This entry was posted in Vegetable, Vegetarian and tagged cumins seeds, green chilli, Indian, potato, sweet potato, turmeric. Bookmark the permalink. I am so impressed that you know how to make Aloo Chat! Now I live in India, I kind of know what it is and what dal is, but before coming here, I had no idea. The photo looks great!! Love the white table! It’s quite carb heavy obviously, but rather satisfying on cold blustery days. Can’t believe you picked up your set at a yard sale – good find. They are stunning. I borrowed mine from my mother! thank you Michelle. I think the plate helps ;o)… a change from my usual white ones.